Doll furniture made entirely of wood like poplar and oak are wonderful additions to any American Girl doll set. Commonly called ‘armoire’, doll clothes closets are roomy, with drawers and shelves providing relevant compartments for storage. A Dowel across the inside compartment is ideal for hanging dolls clothes. Alternatively, the deep compartment is large enough to store an American Doll. Decorative edging across the top afford a graceful finish for the armoire. Varnished and sturdy, the doll clothes closet is ideal to match with other doll furniture such as a hand made wooden bed, crib or chair. You may be a collector of doll furniture. In which case, you may be interested in obtaining a whole range of American Girl furniture from wardrobes to beds, day beds and cradles. They come in simple melamine or press wood which are of the lower range of doll furniture. You could opt for the solid wood furniture that are hand made and are sold at premium prices. Doll beds and spindle cradles made from maple or oak are exquisitely designed to resemble full adult size beds in miniature form. Your American Girl doll can comfortably lie in bed on a soft mattress and pillow, covered in a gaily patterned quilt. The height of the doll bed is normally 12” and the width is 24”. Wooden walnut plugs are added for contrast and the smooth finish ensures the furniture will compliment your American Girl doll. You can purchase prints and plans to assemble doll furniture yourself from several doll furniture makers such as Easywoodprojects. Specifically designed for 18” – 22” dolls, these wooden furniture are ideal for daily play or to display your doll collection. They make perfect conversational pieces and are suitable for individuals who enjoy woodworking. The plans include material lists that are sufficient for the project and reduce wastage. There are 3D pictures to assist in preparing the wood pieces and aiding assembly. Instructions for assembly are detailed and step-by-step to ensure that you can complete the furniture in minimal time. 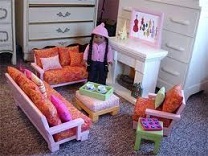 American Girl furniture for dolls can be traditional or contemporary. Traditional wood furniture is made from hard wood like oak and poplar which are designed to last for generations.